A regimen of high doses of biotin, a water-soluble B vitamin, appears to be effective in patients with primary or secondary progressive multiple sclerosis (MS), according to emerging research. A new phase 3 study of the investigational drug MD1003 (MedDay Pharmaceuticals), a highly concentrated pharmaceutical-grade biotin, found that patients with progressive MS taking the drug had significant improvement at 9 months, which was confirmed at 12 months, compared with those taking placebo. "We are encouraged that the primary endpoint was met despite the very high bar for treatment response," said the study's principal investigator, Professor Ayman Tourbah, of CHU de Reims, Neurology, France, in a press release. The results, he said, suggest that MD1003 "could be an important and efficacious treatment for primary and secondary progressive multiple sclerosis." Currently, there are no effective therapies for progressive MS. The results were presented at the Clinical Trials Plenary Session during the American Academy of Neurology (AAN) 67th Annual Meeting and again during a subsequent webcast. Biotin is a coenzyme for carboxylases, which are enzymes critical in energy metabolism and production of fatty acids. It targets two mechanisms that might be involved in progressive MS: promoting myelination and increasing energy production. It's hypothesized that biotin may help to slow, stop, or even reverse the progression of disability associated with demyelination. In his presentation, Dr Tourbah referred to a small uncontrolled "proof of concept" study of 23 patients with progressive MS who were treated with a mean of 300 mg of biotin per day for about 9 months. In this study, 22% of patients had a significant clinical improvement on the Expanded Disability Status Scale (EDSS). The new study included 154 patients aged 18 to 75 years (mean age, about 51 years) with primary or secondary progressive MS and an EDSS score of 4.5 to 7. During the previous 2 years, they must have had a progression on the EDSS of at least 1 point if their baseline EDSS score was 4.5 to 5.5, and of 0.5 point if their baseline EDSS score was 6 to 7. Patients were randomly assigned to placebo (n = 51) or to oral MD1003 (n = 103), which is tasteless and colorless. The mean dose of the drug was 300 mg/day. About 41% of the treatment group and 55% of the placebo group were also taking fampridine, a drug used to manage MS symptoms. Patients were followed for a mean of 9 months and up to 36 months. Twelve patients in the treatment group and eight patients in the placebo group discontinued the study but were included in the intention-to-treat (ITT) analysis. The main outcome was improvement at 9 months, and confirmed at 12 months, using either a change in EDSS score of at least 1 point (if baseline EDSS was 4.5 to 5.5) and 0.5 point (if baseline EDSS was 6 to 7) or a decrease in timed 25-foot walk (TW25) of 20% compared to baseline. In the ITT population, 12.62% of the MD1003 group and 0.0% of the placebo group met this criteria (P = .0051). In the per protocol population, 14.9% of the MD1003 and 0.0% of the placebo group met the primary endpoint (P = .0093). Interestingly, said Dr Tourbah, twice as many patients met the primary endpoint with the EDSS (76.9%) than with the TW25 (38.5%). The results were supported by secondary analyses that showed evidence of a decrease in the risk for disease progression. In the treatment group, there was a mean EDSS decrease of 0.03 at month 12, compared with a mean increase of 0.13 in the placebo group (P = .014). "Overall, these results show patients in the MD1003 group not only did not progress but even slightly improved within 12 months," commented Dr Tourbah. No characteristics appeared to differ between the patients taking the drug who had disease progression and those who didn't experience disease progression, said Dr Tourbah. Infections and infestations were documented in 34.0% of the treatment and 33.3% of the placebo group and nervous system disorders were seen in 28.2% of the treatment and 39.2% of the placebo group. The placebo group had twice as many MS relapses (7.8% vs 3.9%) and more gastrointestinal disorders (23.5% vs 12.6%) and musculoskeletal and connective tissue disorders (19.6% vs 12.6%) as did the treatment group. The two groups had about the same rate of psychiatric disorders, at just under 10%. There was one suicide in the treatment group and none in the placebo group. No one in the placebo group but five patients in the treatment group had "apparent hyperthyroidism," or low thyroid-stimulating hormone. Dr Tourbah explained that a high biotin plasma concentration interferes with immunoassays using biotinylated antibodies. "This requires a specific management plan," linked to a prescription for this drug, to ensure that patients and physicians are aware of this problem, he said. A false laboratory test result could create problems clinically for patients getting pregnancy tests, or various screening tests. This adverse event is "a main issue" with the study, commented Lily Jung Henson, MD, a neurologist specializing in MS at Swedish Medical Center, Seattle, Washington. But despite this concern, the drug was reasonably well tolerated, "which is critical," she said when asked her view of the new study. The fact that the drug may affect axonal metabolism "is exciting" said Dr Jung Henson. She also noted that the advisory board involved with the study included several well-known experts in the field. Although biotin is found in some foods, including peanuts, liver, and certain green leafy vegetables, no dietary source is very high in this vitamin. Biotin is also available in supplement form. The usual daily dose is 30 to 100 micrograms. During the webcast, Frédéric Sedel, MD, chief executive officer of MedDay, warned against MS patients with severe disease rushing off to the health food store or pharmacy to buy biotin. For one thing, it's potentially teratogenic. "There should be a warning here that pregnant women or those who are planning to become pregnant should not take this drug or very high doses of this vitamin," he said. 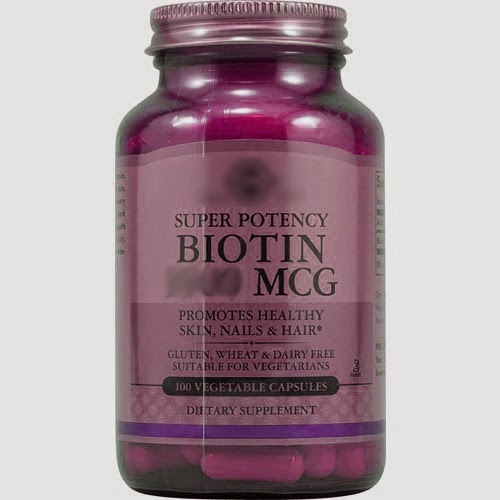 As well, unlike the drug used in the study, biotin found on the shelf may be low grade and perhaps not even be biotin. In some cases, said Dr Sedel, patients get vitamin E when they think they're buying biotin. MedDay will release further results of this phase 3 study, including data on quality of life, fatigue, and other outcomes, at the upcoming European Academy of Neurology meeting in Berlin, Germany.